Finish Off Your Space: Window Treatments Are a Must! Window treatments are a must-have for finishing off a space -- especially when a room has high ceilings. Treatments are important for light and heat control (couldn't live without my roller shades in the summer morning heat) room and acoustics/sound absorbtion. The larger your space and with an abundance of hard surfaces, the more important this is. Besides, ,we all know that aesthetically they add a softness and an interest with their style, color, and pattern. So, do window treatments have to be custom? We wish it was easier, but the answer is most commonly yes. For budget reasons, we can sometimes turn to our friends at Pottery Barn or Restoration hardware (there are other options, too) and do simple panels for a child's bedroom. However in most public areas of the home custom treatments are necessary. Correct size, scale, and fullness are far too important in this final detail to skimp on less expensive options. First, we love real or faux Romans. Here, in this basement (yes, it's a basement) we added real, functioning woven (they come in as number 4 on our favorite list) under a faux roman with tape edge to add pop without being too in-you-face with color. We also love a relaxed roman. These shades are inside mount and help with light control; subtle but essential. Creamy, linen drapery panels. We love the Persian pleats on rings or a ripple fold. While we use cream colored quite often, we do love most drapery panels. They can be a color or pattern depending on the focal point and overall direction of the room. Pulling off pattern is more difficult and not always as classic or long lasting. Getting the Details, Scale and Size Right! Window treatments (as long as I'm not making them) are actually quite simple. The first rule is to almost always go to the ceiling or bottom of the crown. There are few exceptions to this rule, seriously, even if the ceilings are 16+ feet high like this Park City vacation home. The same goes for romans. 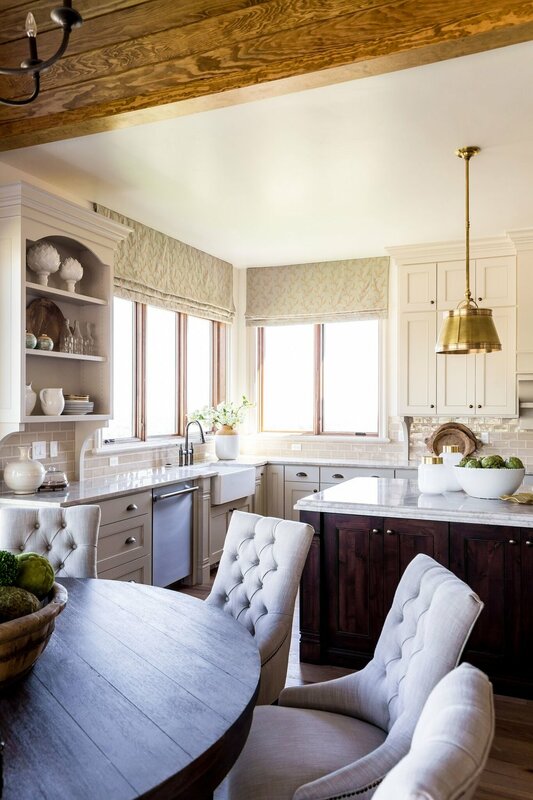 Most often, go for ceiling height for your placement like we did in this Utah County kitchen. Next, be sure to stack the window treatments on the outside of the window. Depending on the window size, we usually make the rod 15+ inches wider than the window when you have enough wall space for the drapery stack. We love the edge of the panel to softly brush the edge of the window and overlap about an inch. And lastly, when faking drapery panels so they are not functional but aesthetic, only still take the rod from end to end ensuring the panel fullness is enough that they don't look too skimpy. The last think you want is cheap-looking window treatments. 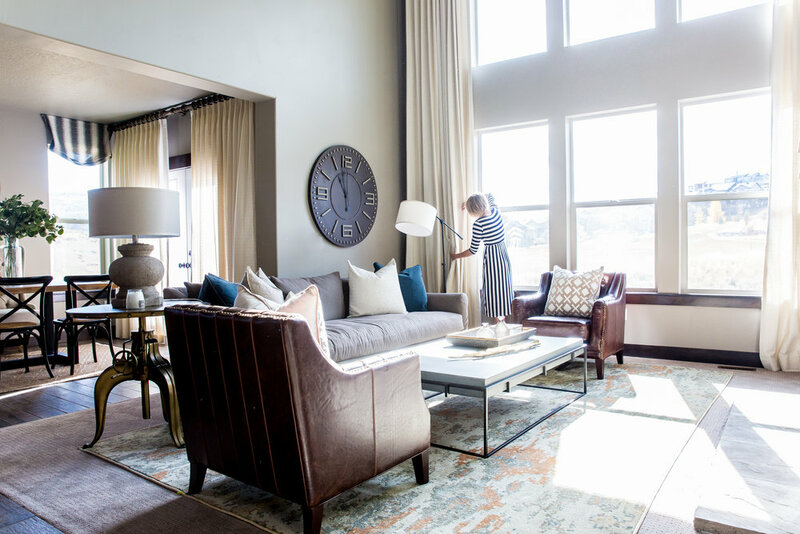 Be sure to check out my Designer Tip (coming soon to the blog) for more tips on how we add interest and detail to a room through window treatments.